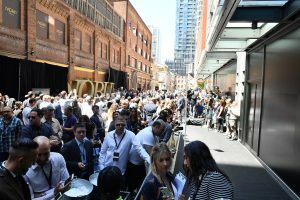 Chef Nobu Matsuhisa, Robert De Niro and Meir Teper join Principal Developer Madison Group and Toronto Mayor John Tory at celebration in Toronto’s Entertainment District. 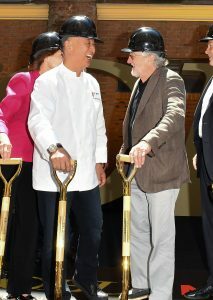 TORONTO, June 11, 2018 /CNW/ – Chef Nobu Matsuhisa, Academy Award winner Robert De Niro and Hollywood producer Meir Teper, principals of Nobu Hospitality, along with Miguel Singer and Nelly Zagdanski, principals of developer Madison Group officially broke ground on the highly anticipated Nobu Toronto – the world’s first integrated Nobu Residences, Nobu Hotel and Nobu Restaurant in the world. The event celebrated Nobu’s fashionable style with acclaimed Taiko drumming ensemble Nagata Shachu ushering in the famed hospitality team alongside principals from Madison Group. After remarks and receiving congratulations from Toronto Mayor John Tory and standing in front of a 40′ 3-D Nobu sculpture, Chef Nobu led a ceremonial sake toast. The stakeholders then picked up golden shovels and planted them in the earth signaling the project’s official groundbreaking. “It’s an exciting project, our partners are terrific people and hopefully we do other things together too,” said Robert De Niro. “Thank you so much to Madison Group; next comes the hotel, residence and restaurant! I am so excited to be here today with all of my team and I’m looking forward to introducing my food to Torontonians,” said Chef Nobu Matsuhisa. Many of the residential purchasers were thrilled to be in attendance, taking pictures in front of the Nobu sculpture and remarking about their excitement that the remarkable project was about to commence construction. 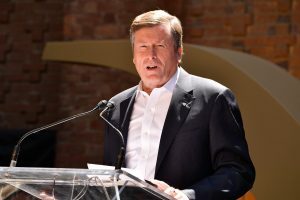 “These principals have chosen to extend a globally respected brand into the combined food, hospitality and residential sector and we are just delighted that they have chosen Toronto to do that, said Mayor John Tory. 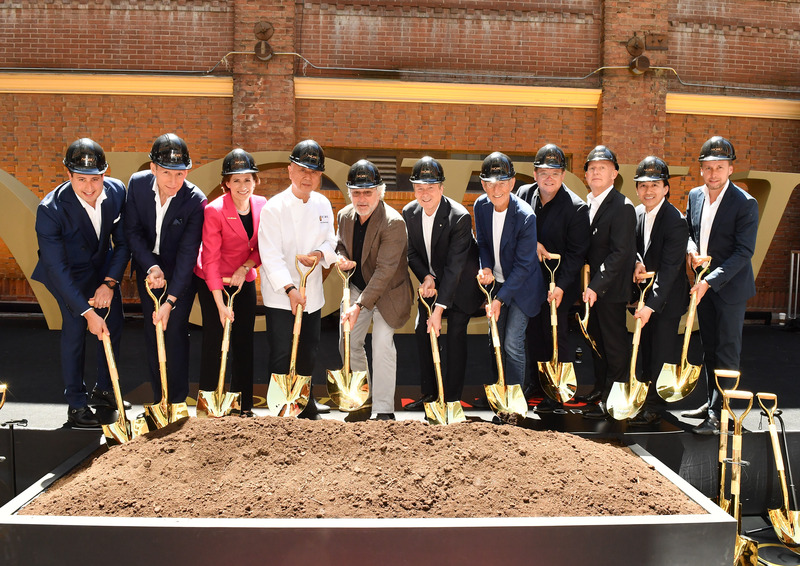 Nobu Toronto, a dynamic project featuring the world’s first very Nobu branded high-rise residences as well as Canada’sfirst Nobu Hotel and Nobu Restaurant will be located in the heart of the entertainment district, transforming Mercer Street with its landmark design. Nobu Toronto will rise 45 storeys above the historic Pilkington Glass Factory with two dramatic residential towers, featuring 660 sold out residential units with enviable views of Toronto. Nobu is one of the world`s most celebrated luxury hospitality brands renowned for its award-winning “Nobu Style” cuisine and exceptional hotel offerings in the world’s most desirable locales. Founded by Chef Nobu Matsuhisa, Robert De Niro and Meir Teper, the growing Nobu Hospitality portfolio caters to vibrant international customers, celebrities, tastemakers and powerbrokers. The exclusive Nobu Hotel Toronto will offer a collection of 36 exceptionally appointed guest suites located atop the west tower, with stunning panoramic views and featuring the best of everything – from distinctive service to energized public spaces. A cornerstone of the Nobu Hotel and Nobu Residences Toronto is Nobu Restaurant with its approximately 15,000 square foot, two-level restaurant, signature bar lounge, outdoor seating and chic private dining rooms. Construction is set to begin immediately. To view more photos visit us and follow on Facebook and Instagram!